Armed with your Pa's workshop handbook and old workbench, you must gather, mine and craft your way to being crowned the number one workshop in the whole of Portia. Be prepared though...it won't be easy! RUN YOUR OWN FARM: Grow and nurture your own crops, as you convert the empty woodland surrounding your home into a quaint little farm! My Time at Portia offers an innovative approach to farming, allowing you to take advantage of planter boxes and semi-automatic irrigation systems. EXPLORE AND BATTLE: Delve deep into the ancient ruins and dungeons of Portia. Mine for resources and uncover what lurks beneath the seemingly peaceful land. It's dangerous to go unprepared... Make sure you're equipped to face fearsome monsters and deadly bosses that stand between you and the secrets of Portia. 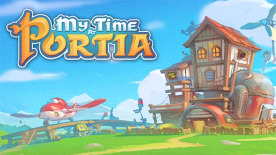 AND THEN THE REST: Portia is an enriching and vivid experience, jam-packed with activities for your enjoyment! How will you spend your time? Fancy trying your hand at cooking? You could challenge your new friends to Rock-Paper-Scissors, or for the more daring how about a little bit of sparring? Take your pick! There's also tonnes of mini-games, animal riding, and festivals to enjoy. Or maybe you just want to kick-back and spend the afternoon fishing? Its up to you how you spend your time at Portia!